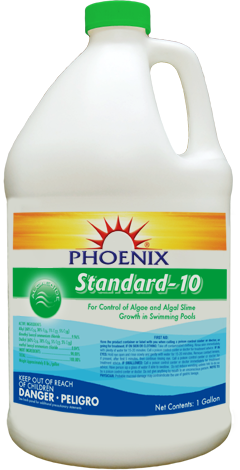 Phoenix Standard 10 Algaecide - Phoenix Products Co.Phoenix Products Co. Effective in controlling algae and algal slime growth in swimming pools. This product is compatible with most chemicals normally used in swimming pool maintenance: however, in its concentrated form, this chemical must not come in contact with high concentrations of chlorine or any other oxidizer. Do not mix this product and chlorine or any other oxidizer together before adding to the pool. These chemicals must be handled separately. This product is not a stand-alone product. It must be used with halogen based pool sanitizers. This product requires no special equipment for treating swimming pool water. The correct use dilution may be added directly to the pool in any spot or added to the water circulation equipment, it is formulated to complement most swimming pool sanitizers. Standard 10 Algaecide is effective against the growth of algae, and is efficient and non-staining when used as directed. It will not evaporate and its algae fighting abilities actually increase as pool water temperature increases. For Halogen based pool sanitizers, ensure all pool equipment is working properly. Backwash the filter system following manufacturer's directions, Adjust pH between 7.2-7.6. Adjust chlorine residual to 1-3 ppm. Apply an initial treatment by following the appropriate steps: Backwash the filter thoroughly, Vacuum algae debris and thoroughly brush pool, add 26 ounces of this product to each 10,000 gallons of water, or ration thereof. Add a maintenance dose of 1 quart in 50,000 gallons every 3-5 days or as needed. Booster Application: Add 1 quart of this product in 50,000 gallons of water after a heavy or prolonged rainfall or when there is a heavy bathing load. Effective in controlling algae and algal slime growth in swimming pools.